Located a few hours south and west of Death Valley in California's Mohave Desert, the small city of Barstow averages about 5 inches of rain annually. Across the continent, Pensacola, Florida, has more than double Barstow's population and more than 12 times the amount of rainfall. Yet for gardeners, these cities share an important characteristic. They're both part of the U.S. Department of Agriculture's Plant Hardiness Zone 9, in which plants survive minimum winter lows ranging from 20 to 30 degrees F.
In gardening, hardiness generally refers to the ability of a plant's roots to survive winter cold for re-emergence the following spring. USDA zones are based on averaging decades of winter temperature data from around the nation. The agency divides all of America into 13 winter climate zones, each differing by ten degrees and divided into two subzones varying by 5 degrees. So Zone 9a minimums range from 20 to 25 degrees F, whereas Zone 9b is 25 to 30 degrees. The interactive USDA Plant Hardiness Zone Map uses buckskin brown to indicate zone 9a and pale coral pink for zone 9b. For an overall explanation of the map, please read Getting Started: USDA Plant Hardiness Zones. At Flowers by the Sea, we emphasize hardiness zones, but not subzones. Many factors may affect the survival of a perennial or shrub sage and may be more important than a half-zone difference in temperature. These factors include microclimates and general growing conditions. Microclimates are parts of your yard that are colder or warmer than the rest of the landscape. For example, cold air that flows down a slope and lodges next to a fence creates greater chill whereas planting next to a brick wall radiating heat absorbed from the sun may impart greater warmth than elsewhere in the yard. Successful gardening requires analyzing beneficial placement of a plant and its basic growing needs, including intensity of sun exposure, type of soil and amount of moisture. A water-loving plant, such as Gravid Sage (Salvia gravida), will wither in Barstow. Conversely, Giant Purple Desert Sage (S. pachyphylla 'Blue Flame') needs a dry, gravelly environment and will likely die from root rot in Pensacola. Even if your area is classified as being in Zone 9, it also may be that you live on the edge of a colder (Zone 8) or warmer (Zone 10) area. In the first instance, you may want to insure against frost damage by selecting plants that tolerate lower winter temperatures than those of Zone 9. Regarding gardening in or near Zone 10, plants from colder winter zones grow well in warmer ones as long as other basic needs are met. The California native Bee's Bliss Sage (S. x 'Bee's Bliss') -- a Zone 8 plant -- is a good example and grows well from northern to southern California. For more information about making choices for Zone 10, please read Ask Mr. Sage: How to Select Plants in Warm Zones. Zone 9 varies from damp to dry. From the perspective of a Barstow resident, some areas may seem super moist even if they are experiencing a shortfall of precipitation as compared to historic averages. The zone travels a broad, deep arc along the Pacific, Gulf and Atlantic coasts. Although its furthest northern point is somewhere in Washington state, it doesn't become obvious on the USDA map until Coos Bay, Oregon, which historically has averaged a soggy 65 inches of rain annually. However, due to intense drought along the West Coast, Coos Bay's precipitation decreased by about one-third as of August 2015. Earlier, in June 2015, Oregon declared the county as suffering from drought. When considering the Coos County water shortage, it's important to remember that drought is relative. It depends on the amount of moisture needed by plants and animals that have adapted to a locale. Fortunately, some plants, such as Japanese woodland sages, are made for shady yards in Coos Bay whether moisture is at its normal high or significantly lower. Zone 9 is intermittent, appearing and disappearing amid stretches of cooler Zone 8 winter climate and warmer Zone 10 areas as you travel down the Northern California coast to the Flowers by the Sea homeland of Mendocino County. The historical climate averages for our county are about 43 inches of rain annually and moderate temperatures year round. However, similar to Coos Bay, the rainfall in Mendocino County as of August 2015 decreased by at least one-third while temperatures rose dramatically with many days around 90 degrees Fahrenheit. This pattern, of course, intensifies a water shortage. From Mendocino, Zone 9 leaps further south to the agricultural lands of San Joaquin Valley's Merced County. According to an August 20 report by Sunset magazine, some locations in the valley are dropping nearly a foot a year because there is little rain and virtually no snowmelt to replenish underground aquifers. From the perpetually dry Barstow in southeastern California, the moderate winter temperatures of Zone 9 travel north and east to the equally dry Las Vegas in the southern tip of Nevada. These are cities made for varieties of super drought-resistant Central Asian sages such as Caucasus Sage (S. canescens var. daghestanica), which has silvery green foliage. Silver or gray foliage is a sign of drought resistance, because the leaves are covered with fine hairs that help conserve moisture. Open the Salvias by Color category in the product menu and click on "Gray and Silver Leaf" to find a concentration of these plants. Traveling southeast on a diagonal along the Prescott and Tonto national forests through Arizona, rainfall begins to increase in the Zone 9 cities of Phoenix (8 inches annually) and Tucson (12 inches). The zone mostly skips New Mexico and then reappears in the damper Del Rio, Texas, (20 inches), which borders the northwestern Mexican state of Coahuila. Drought is no stranger to any of these areas and intensifies the problems of a naturally dry climate. For an overall understanding of drought, dry climates and how to garden in xeric conditions, you may want to read Getting Started: What is Drought and Xeriscaping. The Zone 9 road trip becomes seriously damp as you continue northeast into Houston (about 45 inches a year) and the southern end of Louisiana. In New Orleans, you'll discover almost 64 inches of rain annually -- an amount that is roughly equal to that of its Zone 9 neighbor, Biloxi, Mississippi. From Biloxi, Zone 9 almost totally skips Alabama, then shows up again in the Florida panhandle city of Pensacola from which it proceeds to much of northern and central Florida where rainfall begins to decrease. However, the Southeast is a generally damp place. So Zone 9 remains wet as it tapers northward through Brunswick, Georgia, (45 inches) and finally ends around Charleston, South Carolina (51 inches). Salvias are the largest genus -- some 900 species -- in the mint family (Lamiaceae) and grow in a wide variety of environments around the world. Many sages are surprisingly adaptable to environments outside their places of origin. Yet good drainage is a condition almost all of them require in order to avoid root rot. Also, if you want to succeed in growing particular species, it's important to pay attention to whether local growing conditions meet their basic needs. Levels of sun and water are particularly important. Consider, for example, the differences between the excellent bee plants Sonoran Sunset® Anise Hyssop (Agastache cana 'Sinning') and the water-loving Salvia companion Swamp Milkweed (Asclepias incarnata 'Cinderella'). The first plant thrives in a dry, hot, gravelly environment. The second is also heat tolerant but loves saturated soils. 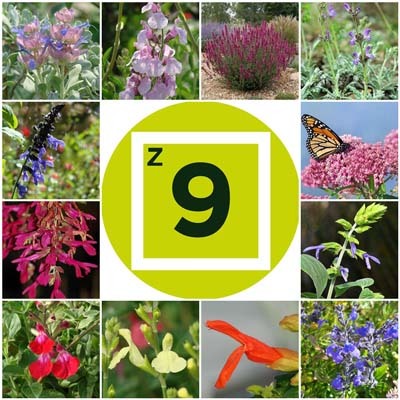 The product menu atop the homepage of our website and online catalog offers many ways to search for what you need, including categories such as Salvias by Zone, Salvias by Culture (here's where you find the water-loving list), Bee Plants and Salvia Companions. Or you can start with the broadest category -- Salvias A to Z. Another search aid is our photo illustrated Salvia Finder tool, which gives you the opportunity to filter FBTS sages based on traits ranging from flower color to growing conditions, including zones. You'll find a link to the Salvia Finder at the top of each webpage. Most plants have a range of zones. For example, great water-loving species for Zone 9 in the Southeast include the Anise Leaf Sages (S. guaranitica spp.) and their relative Costa Rica Blue Sage (S. x 'Costa Rica Blue'). But their coldest zone is 7. So when using the Salvia Finder, keep the idea of zone range in mind. Expect to be offered selections including ones from zones with colder winter lows than your own area. As to sun exposure, let's pretend you have a somewhat shady backyard in the Zone 9 city of Sacramento. After selecting a hardiness zone in the filters (perhaps 7 or 8), go down to "Exposure" and choose "partial shade." Next, select a filter based on local water needs. Sacramento is not nearly as dry as Barstow, where gardeners need plants that thrive with almost no supplemental watering. In our filters, this category is labeled "drought resistant." However, many of the sages that FBTS grows prefer average watering despite being drought tolerant. Average watering is based on local rainfall and water availability, including gray water you save from other household uses. Salvias in the Autumn Sage (S. greggii) and Mountain Sage (S. microphylla) group -- classified as being drought tolerant yet "average" for watering -- would be a good choice for Sacramento. If you live in a part of Zone 9 that is either extremely dry or extremely damp, the most efficient way to search for sages may be the Salvias by Culture category in the product menu. When that page opens, two of the choices are drought tolerant and moisture loving. Need a groundcover? 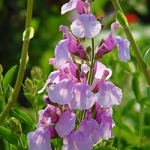 Go to the category Salvias by Use in the product menu, then click on the groundcovers subcategory. There are many ways to find what you need in the FBTS catalog. Our nursery serves home gardeners, businesses and public gardens throughout the U.S. Whether you live on a coast or somewhere in-between, we pay attention to your needs and can help you. FBTS has Salvias and companion plants for a wide range of growing conditions. Please call or email us to discuss your concerns about selecting the right plants for your Zone 9 landscape whether its dry and dusty, wet and muddy or somewhere in-between. We've got ideas for you. Amazing selection of Salvias! Great prices. Beautiful, healthy plants! What a treat to have such a wonderful nursery! Every time I order from fbts, the plants arrive and are beautiful, even after traveling across the US. I have been very satisfied with the plants I have ordered. Ordered 4 plants during a recent sale. They arrived as scheduled, securely packed, and very healthy looking. Not even two weeks later they are putting out new growth. Can't wait to se how they bloom next season. Careful attention to detail wins my loyalty. The plants arrived in flawless condition. Their wrapping paper still damp!!!! The plants them selves are hearty and healthy. I love exploring the world of salvias in my challenging environment.